Buying a home is a lot harder than it used to be. Lenders have much stricter standards, and a high down payment is usually required if your credit is not perfect. In this buying climate it is important to have a very strong understanding of exactly what you can afford when it comes to buying a home. Before you even approach a bank about procuring a loan, it may be a good idea to do some of your own math first, so that you have a better understanding of where your income, debt, and the amount you can afford for a down payment leave you in terms of how much you can afford for a home. 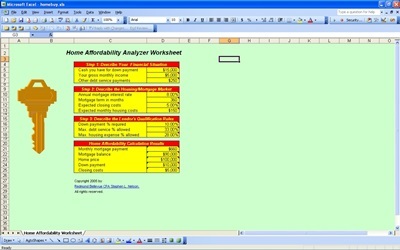 One great way to do this is by using a home affordability analyzer. It wont cost you any money, just a bit of your time, so you have nothing to loose and everything to gain by giving it a try. The Excel based spreadsheet will help you calculate things like your closing costs, monthly mortgage payment, down payment and monthly housing costs on a given home price. If you use a home affordability analyzer on a few different houses you are considering, you will be able to see how they stack up against each other in terms of how affordable they would be for you to purchase. The higher the percentage of the purchase cost that your down payment is, the less you are going to end up spending monthly on your mortgage. If you have $10,000 to put down on a home, you are going to pay less monthly if you put that toward an $80,000 house than a $100,000 house. Using a home affordability analyzer you will be able to calculate the difference this will make in your payments, and that is only one example of how it can be used to calculate home buying costs.